1991 SG 678 O/printed 2k on 7.85k on SG 577 Pope John-Paul 2 a very scarce stamp cat £100 U/M. 1991 SG 668 O/printed 2k on 45n on SG 453 Queen Mother a very scarce stamp cat £90 U/M. 1991 SG 657 O/printed 2k on 25n on SG 432 Queen Mother a very scarce stamp cat £05 U/M. 1991 SG 675 O/printed 2k on 6.5knon SG 597 Fruits a very scarce stamp cat £42 U/M. 1989 - SG 579/951990 - SG 625/38. Unmounted Mint. 1991 SG 664 O/printed 2k on 35n on SG 468 (Xmas) a very scarce stamp cat £75 U/M. 1991 SG 667 O/printed 2k on 45n on SG 430 5th anniversary a very scarce stamp cat £60 U/M. 1991 SG 676 O/printed 2k on 6.85k on SG 476 Pope John-Paul 2 a very scarce stamp cat £60 U/M. 1991 SG 670 O/printed 2k on 1.60k on SG 470 Christmas a very scarce stamp cat £75 U/M. 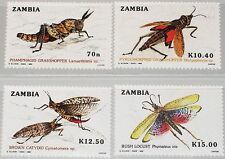 Good condition sheet of Zambia. It is the 2000, Paradise Lost, Exotic Birds sheet. 500 DIFFERENT ZAMBIA. The picture shows 100 different you will of course receive 500 different. 1991 SG 669 O/printed 2k on 45n on SG 446 United Nations a very scarce stamp cat £45 U/M. 1991 SG 671 O/printed 2k on 1.70k on SG 451 Beetles a very scarce stamp cat £45 U/M. Set from 1985 unused with gum never hinged. Complete Set of 9 4 3. Unmounted Mint. Complete Set of 17. Unmounted Mint. (Condition: MNH. / weight etc.). up to 20 grams / up to 0.70 ounces. up to 50 grams / up to 1.75 ounces. Complete Set of 4. Unmounted Mint. In the event that you will be receiving multiple envelopes, I will note inside for example 1of4 2of4. NOTE ON STAMP CONDITION. Condition: MNH. 100 - 500 grams 3.50-17.50 ounces. up to 50 grams / up to 1.75 ounces. up to 20 grams / up to 0.70 ounces. 1989 Frogs and Bats sets (#462-5, 466-9), four COMPOSITE MASTER PROOF SHEETS in FULL COLORS on glossy plastic sheets (for sharper image than on paper), each sheet with one Frog value and one Bat value, UNIQUE, exotic and very beautiful group,F-VF. 19 Values. Excluding SG 660/1, 663, 672. 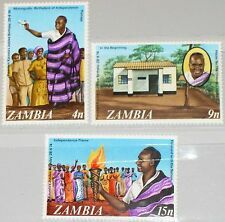 Zambia 1989 Red Toad 50n vert pair with superb misplaced perforations, unmounted mint SG 567.